Сребърни бебета Мопс родени на 05.05.2018г. Сребърни бебета Мопс родени на 05.05.2018г. в лицензиран и регистриран развъдник Мопс България. Silver babies Mops born on 05.05.2018г. in a licensed and registered breeding station Mops Bulgaria. Substandard veterinary control is underway. Will be handed over to their new owners after the age of 45 days fed with high-grade granules Happy Dog, a quality can for small dogs. Defused internally and externally. As with the necessary vaccines for your age, passport and instructions for their growing. Kennel Pug Bulgaria is the largest licensed and registered kennel Baby Pug and definitely does not want to pursue the sale of dogs bred Pug regardless of the cost of pet shops, markets, resellers and wholesalers or retailers! 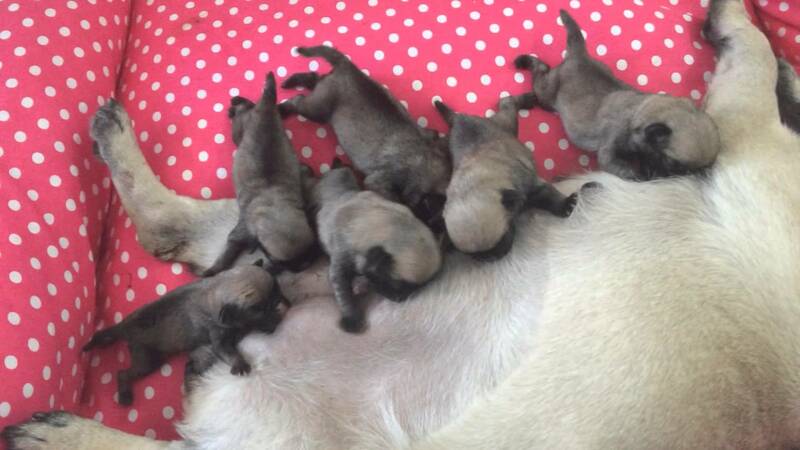 Babies Pug Pug breeder from Bulgaria are fed with pellets class super premium Happy Dog Mini Baby + Junior 29 for small dogs from one to twelve months. Pedigree Junior 400g complete canned food for young and teenage babies from one to twelve months. Preliminary if you want to keep from our pure-blooded babies pug. Babes Mops from licensed and registered breeder Mops Bulgaria Ltd. 2018d.